I've been doing a bit research into speed signs after I spotted one at the local university. Initially it wasn't clear how they worked, but after a bit of googling it became clear they were radar based. Normally I'd be happy and leave at that, but when you can get a simple Doppler radar module from eBay for under ten dollars, I had to have one to play around with. They're nothing special, they have a limited range and aren't too accurate, so they can't be used to fine someone for speeding because it wouldn't stand up legally. They can however be used for purposes like letting drivers know if they're doing over the speed limit, if you are under the speed limit you get a smiley face. Something I initially thought wouldn't work, but it turns out to be rather effective. 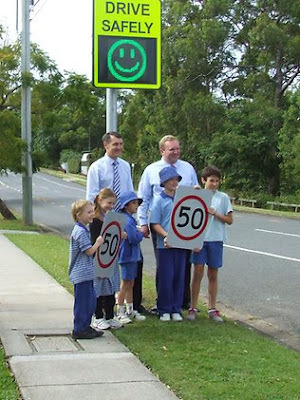 Recently they've started appearing in our local area around schools where the speed limit drops from 60 km/h to 40 km/h between the hours of 2pm and 4pm on school days and they seem to be making a difference. If you're unaware of how Doppler radar speed measurement works it's pretty simple. The device transmits a radio signal at a particular frequency, as that signal is reflected off a moving object its frequency is slightly changed. The unit measures this reflected signal and uses the frequency difference between the transmitted and received signals to determine the speed of the object. This usually occurs in the microwave region. My module for instance operates at around 10 GHz. The specs according to eBay are below. E Plane 3dB Beamwidth : 36'. There wasn't a data sheet for this module, but this one I found on Google seems to be an exact match. Now you know the principle behind it, back to the radar module. The bottom of the board is mostly ground plane with two patch antennas, the one on the left is the transmitter an the one on the right is the receiver. 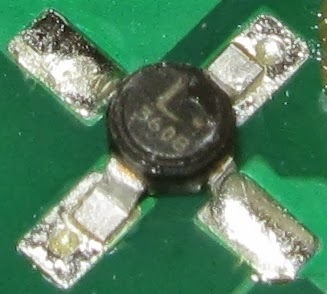 I think the two areas without solder mask in the middle of the ground plane are low inductance paths to ground for the transistor in the oscillator. RF and microwave in general is something I don't know a lot about, but I think I can work out the general operation of the board. Of course with the frequency of operation in the 10 GHz neighbourhood the board is covered with the obligatory microstrip stubs and filters. I'd love to learn how that stuff works but for now it's akin to magic. The transistor on the bottom right of the board appears to be the oscillator. 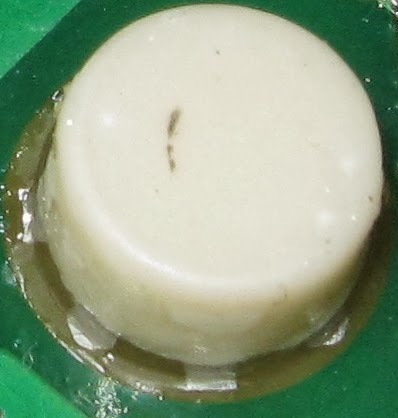 I can't find out much about the white cylindrical block, but according to http://www.shfmicro.com/gunn.htm it appears to be a Barium-titanate "puck" to stabilise the frequency. 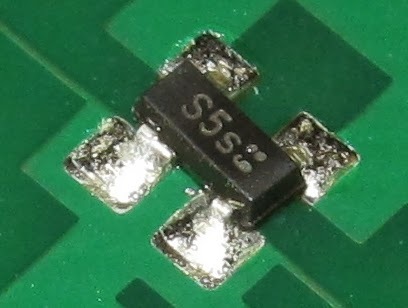 Given the topography of the circuit, it looks to be part of the feed-back circuit of the oscillator even though it doesn't seem to be electrically connected to the circuit. I'm going to put that down to some sort of RF coupling, or as I call it jiggery pokery. EDIT: A helpful commenter has informed me that the white object is a dielectric resonator. Things make more sense now. The output of the oscillator goes up to the middle on the left and off to the transmitting antenna. It's also fed to what I believe to the mixer located near the centre. The mixer also receives an input from the receiving antenna on the right. The output is fed to IF signal at the top left. This in theory should contain a signal close to DC and a frequency close to 20 GHz. I doubt the 20 GHz will make it out though, it's possibly already filtered out by the radial stub near the top of the board. The PCB material will also play a part. Given the price of the module it's like to have high dielectric losses at high frequencies. The top of the board is covered with an aluminium shielding can that has what appears to be a tuning slug that is aligned with the white object on the board. Board hooked up for testing. 5 Volt DC applied, signal output is displayed on an oscilloscope. I initially started testing it by moving a piece of plastic toward and away from the PCB, I quickly realised that it wasn't going to reflect microwaves and wouldn't work. (What was I thinking). Luckily I had a sheet of aluminium checker plate lying around. That did the job. The signal below is the result as I moved the sheet toward the device. The frequency will be proportional to the speed and the magnitude will be related to the size of the reflecting object and its distance from the module. As a side note the module uses 40 mA in standard operation. Let's just take a quick estimate of the signal above. Near the centre of the plot the period of the waveform is around 5ms, giving a frequency of 200 Hz. See http://en.wikipedia.org/wiki/Dielectric_resonator for an explanation of the white "puck"